Our Warriors Tasset Belt is a must for those of you who do not want to wear a breastplate just to have Tassets. Before, tassets would only be attached to body armour, never available by themselves. If you just need tassets, this is the belt for you. 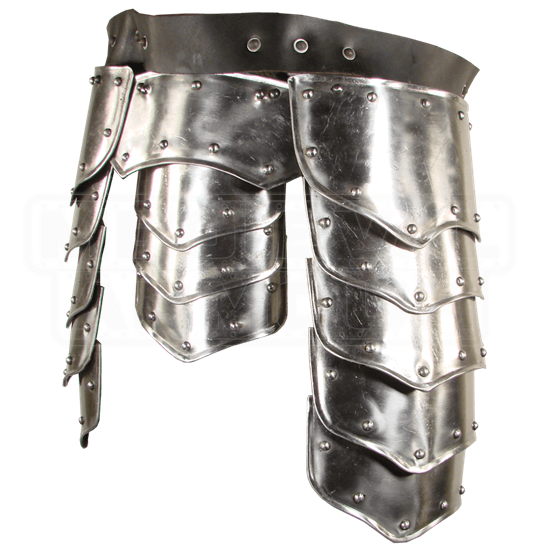 These are also great to add to an existing breastplate that does not have tassets. Our Tasset Belt not only provides protection for the upper thigh, but there is also a center section providing protection for the groin area. The belt buckles at the waist and also have suspenders that go over the shoulders for added support. The color of the leather belt can vary between black or brown - we will send what is available. If you want a specific color, please call to see what is in stock. Small/Medium: Center protector is 7 Inches wide across the top, 6 Inches wide across the bottom, and 8.25 Inches long. The side protectors are 8.5 Inches wide across the top, 8 Inches wide across the bottom, and 11 Inches long. Large/X-Large: Center protector is 9 Inches wide across the top, 7 Inches wide across the bottom, and 11 Inches long. The side protectors are 11 Inches wide across the top, 10.5 Inches wide across the bottom, and 13 Inches long. No one should go into battle unprotected! 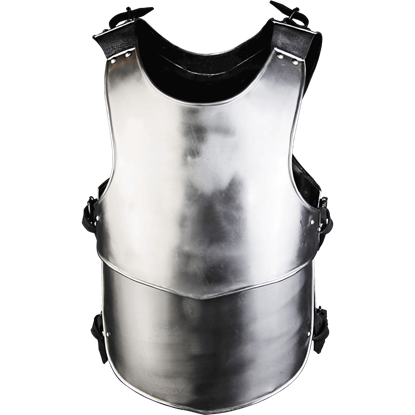 Make sure you are prepared for your next LARP event with the Steel Elias Cuirass, which covers your upper body. The torso armour has buckles for affixing spaulders to the design.